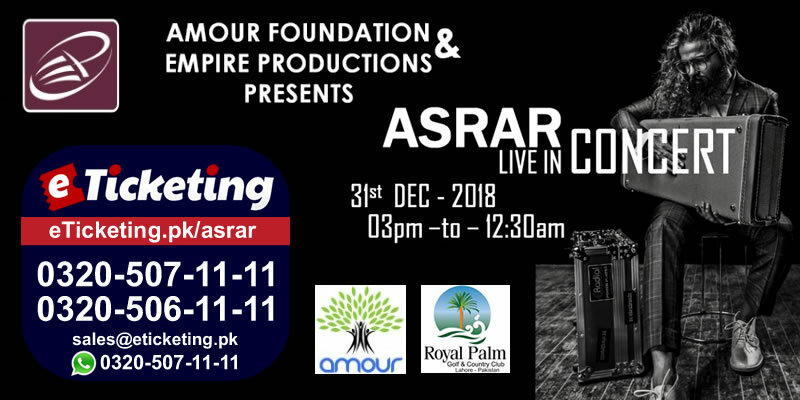 Stay tuned for upcoming events for Asrar in near future. Asrar is a famous singer and songwriter from Lahore, Pakistan. From early age, he was inspired by Sufi music and started writing his own songs. He came to recognition from Coke Studio. He sings in the Genres of Punjabi, Sufi rock and Pop. He performs Vocals and has command over Guitar. Asrar released his debut single "Nai Saiyyo" in 2011. He joined the television program Coke Studio in 2014 and released his song "Sub Aakho Ali Ali" during the show. He also presented "Shakkar Wanddan Re" during later episode of Coke Studio Season 7. He made his Bollywood debut in July 2015 with a song "Afghan Jalebi" for the film Phantom. Asrar has also recorded songs for Pakistani films like "Bhaag Ja" for Wrong No., "Shakar Wandan" for Ho Mann Jahaan and "Funkaraan" for Actor in Law. Asrar has also started his own music production company named Soul Speaks. Empire Productions is a group of creative, diversified, dedicated, talented, experienced and professional, committed to provide quality services to its clients, so clients can walk into the future gracefully and confidently with all multiple solutions and back plans for their business growth. Best Viewed at 1024 x 768 pixels and above. This Page loaded in 0.06706 seconds on Tue, Apr 23, 2019 (21:12).